Another great idea from "The Mailbox" magazine. I get these magazines monthly and they always have so many great new ideas, along with the great ones I've already come up with (Ha Ha). I am sometimes sad I can't get it all in. 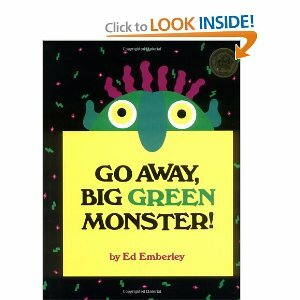 For October they had a great craft to go along with the book, "Go Away Big Green Monster," by Ed Emberly . It was, of course, a green monster. He was very easy, but the kids thought he was great. The activity says to use green paint. We missed the day before Halloween and I wanted the children to be able to take the craft home, so we used a green stamp pad. Make both of the children's hands green, then press them onto a piece of paper. Have the thumbs pointing to the center of the paper and overlapping. This is the basic shape for your monster. If you have used paint, you will need to let these dry. Now the children just need to add the finishing touches. Let them glue on two eyes, a nose, and the teeth. The first class glued on a red pompom nose. We ran out so I cut some out of paper--I guess you could really use any color nose you wanted. Then I drew a smile onto their monster. I had precut white triangles to represent the teeth. The children glued the teeth to the smile line and he was done. Super cute! That is an awesome magazine. When I was in the classroom, I would often refer to it for ideas.